This book annoyed me so much, I gave up on it about 20 pages in. Before I hurled it across the room, however, I did scan my way through the rest of it and found it oddly easy to hit on what seemed to be the major plot points. What I saw of those annoyed me as well. I think an editor could have saved this book–or at least gotten me past page 20. But maybe Stradal’s editor was as green as his writing. The book starts off in Minnesota and the very first line is “Lars Thorvald loved two women.” I was born in Minnesota and spent about 25 years of my life there. There may indeed be multiple people in Minnesota named Lars Thorvald, but in a chapter called “Lutefisk” (disgusting, Norwegian fish dish), it is so cliche to pick a name like that. It’s like Rose from the Golden Girls decided to tell one of her stories. Now this takes talent, a cliche in the first two words of the book. And then on page 2 there’s St. Olaf’s Lutheran Church. There are more than one St Olaf’s churches in Minnesota for sure, but again, choosing this name smacks of the Rose Nyland school of Minnesota storytelling. “Where’d you get it from? St. Paul’s Farmers’ Market?’ How about just “the farmers market”? “Mom’s Chicken Wild Rice Casserole” Stradal packs the book full of forced Minnesota authenticity and then uses the word casserole. No. We call them hotdish. The only time I even heard the word casserole as a child was on TV. “Lars was lying on the brown shag area rug, reading to his daughter from James Beard’s Beard on Bread…” Just saying “cookbook” would be even better, but short of that, why oh why does Stradal have to spell out for us that Beard on Bread was written by James Beard? We have Google, or a cultural frame of reference, or it’s a detail that really doesn’t matter. “…the famous West Coast sommelier Jeremy St. George” Sounds like one of the fancier characters on All My Children. “…she opened a single-vineyard Merlot from Stag’s Leap that she’d been saving…” I might even strike “single-vineyard” but okay, he is trying to show that she really does know her wine. “…Lars’s rounds at the St. Paul’s Farmers’ Market were more logistically difficult…” and then in the next paragraph: “But the St. Paul Farmers’ Market would, as always, reward their efforts.” Really? Wait, which farmers’ market? Could we have the address including zip code? “That’s where the New French Cafe gets their tomatoes…referring to the trendiest of the new Minneapolis restaurants.” Stradal doesn’t allow his readers any credit. You don’t have to know the New French Cafe–or have it described–to understand they are referring to a business that wants quality tomatoes. “The Southeast Asian vendor sat on a blue Land O’Lakes milk crate…” OMG, another Minnesota brand! This book is SO authenticate. If only he would mention 3M. (He eventually does.) I even object to “blue” the only purpose of which seems to be to show the reader that Stradal didn’t miss the day they talked about descriptions in his creative writing class at the Learning Annex. “…unsmiling, through Ray-Ban sunglasses…” I don’t object to the proper noun here, what I object to is the need to add the word “sunglasses”. We aren’t stupid J. Ryan. And it just goes on and on and on. There are so many capital letters you can pick out these annoying instances just by flipping through the book. Which is what I did. I had more to say, but I think I’ve tired myself out. Time for a nap. Thanks for the heads up, I’ll definitely cross this off any TBR lists. It sounds like really lazy writing. Just throwing in a lot of brand names and proper nouns does not make for good descriptive writing. It’s just another form of telling, not showing. And is the image of the book cover upside-down because you threw it across the room? 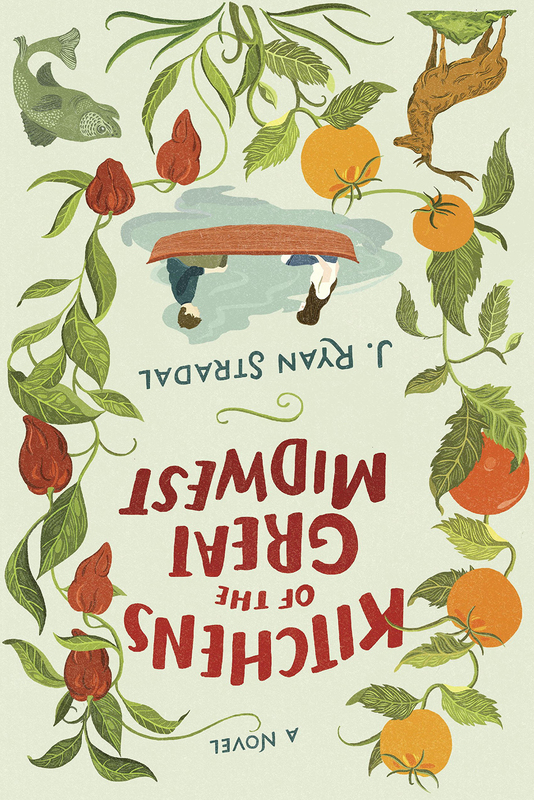 I’ve decided that every book I hate gets its cover posted upside down. Typically flags flown upside down signify a ship is in distress. In this case literature is in distress. I should note, it applies in other countries as well. I’ve never been to Minnesota (outside of an airport anyway), but still agree with your edits. Just removed this from my wish list… you’ve never steered me wrong yet. Chuckling at the reason behind the upside down cover! Thanks, Thomas. I kind of focused on the Minnesota ones, but there were many other instances that would have annoyed me in a similar way. Love the upside down cover. You did spend quite some time on a book you so hated! This smacks of creative writing classes where they guide you to include actual details to make the book authentic. And it actually does the opposite. Thomas, I completely agree with your editing – and with hurling the book across the room. but. where I live it is “casserole” – all the time. If someone said “hotdish” we’d be thinking “uh, yeah…of course it’s hot…it’s a casserole…” :-) mind you, I’m Canadian and live approximately just northwest of Minnesota. Like you, I don’t need to know the name of the casserole. Casserole with a small “c” works just fine. It’s pretty much casserole everywhere but Minnesota. We also don’t play Duck, Duck, Goose. We play Duck, Duck, Gray Duck. I liked this book. Enough. Not a lot. I read it while in Italy last year and needed something to nod off with at night. All the proper nouns did not bother me. I focused more on the food and liked it for the viewpoints of the different characters. It was kind of a gimmicky book, but it worked for me. Now don’t get me started on The Corrections by Franzen which did go flying across the room. I would agree with you about Franzen. I have a pet peeve about clumsy name dropping in books. Makes it so I can’t see straight. I think it’s hilarious that you posted the picture upside down to mark your hatred of it! It’s only the third time I’ve done it. First time was with A Little Life. I was trying to turn his frown upside down. This review made me laugh! I tried reading this a while ago and didn’t make it very far. I don’t remember my exact objections, but they certainly weren’t as specific as yours! I totally get it though. Those things would have annoyed me too. By the way, I love the upside down cover. Very effective. I know about flying flags upside down, so I like your way of thinking! Omg I want to steal the upside down cover thing. I will credit you if I do. I’ve struggled through some Maine-themed novels that do likewise. Maine cliches abound and deploying them for artistic or literary purposes can be… problematic.